For Arras, the Coupe de France de Basket is the last and only chance for EuroLeague Women qualification. Even with a short roster they made no mistake in beating Charleville-Mézières for a place in the semi-final. LF2 leaders Perpignan Basket had a home tie against the leaders of the LFB Bourges Basket. Perpignan were able to play Pauline Lo for nine minutes in the second half, her first game in almost two months. Laina Badiane also returned from injury and played for 15 minutes but Agathe Nnindjem-Yolemp was absent. Bourges Basket did not make many mistakes early on and dominated the first quarter (22-13). Perpignan had a good run during the second quarter, especially with their long distance shooting. With Bourges Basket giving the bench players an extended run, Perpignan managed to reduce the deficit by 2 points by the end of the quarter (26-39). After the break Bourges Basket stepped up defensively and then put the game out of reach of their hosts by the end of the third quarter (55-37). The two teams just played the final quarter out with both coaches frequently changing players. 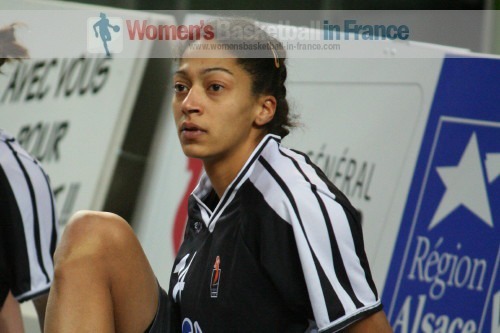 For Bourges Basket Emméline Ndongue (in picture), Cathy Joens and Nwal-Endéné Miyem (10 rebounds) were the top scorers with 16, 13 and 11 points respectively. Céline Dumerc led the assist count with 7. For the hosts Hélèna Ciak (12 rebounds) and Clémentine Samson led the scoring 16 and 11 points each. Arras kept their hopes for Paris Bercy alive with a well constructed victory against Charleville-Mézières (72-53). After a tight first quarter (20-19) in favour of the hosts, the pendulum swung in favour of Arras for good with an 10-0 run to lead the game (32-21) with just over 16 minutes played. Charleville-Mézières only managed 2-from-11 shots all through the second quarter and went into the interval trailing by 15 points (24-39). Apart from 30 seconds during the third quarter, Arras maintained a double-digit advantage all the way to the end of the match. Gabriela Marginean and Valeriya Berezhynska led the scoring for their respective teams with 18 points each. Arras and Bourges Basket join Challes-les-Eaux and Nantes-Rezé in the draw for the semi-final of the Joë Jaunay French Cup trophy.